We all know I came for the sister relationship. I am such a sucker for books that deal with sisterhood and the relationship between them. I was not at all disappointed by them! (And while we’re on this, look at the cover – it is the perfect cover for this book!). But furthermore, this book is also about family and what we will do for justice. When we are wronged, exactly how far will we go for retribution? For vengeance? To see justice served? And how do we go about it? We were able to watch their relationship develop as they both go about trying to see justice done and help their families in different ways. They don’t always get along or even have the same approach, but their bond keeps them together. I loved Tesara’s cleverness and Yvienne’s fiery spirit. There were parts of both of them I wish I could see in myself. While the sisterhood relationship was my favorite, I was also really impressed with the plot – especially the ending third of the book. There are all these threads that we don’t even really pick up on until then that are revealed in this sort of bewitching dance. Many other people and elements come together to deliver a thoroughly entertaining plot. 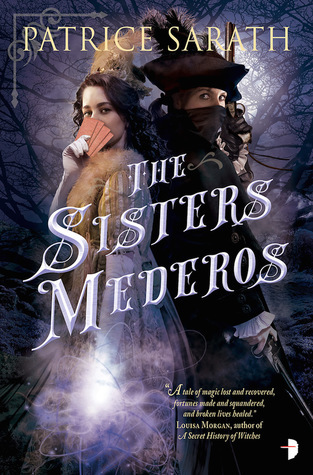 If you enjoy sisterhood, make sure you check out The Sisters Mederos on Goodreads. What is your go to element or plot point that makes you read a book? I also cannot resist witches. Sounds like I need to read this! I love a good sister relationship and an interesting plot! Hmm, your comments made me think if there any books I love with starring sister relationships…it seems I prefer brother sister relationships, maybe because I don’t have a brother but I do have a sister. Sounds like this would be a good book to start reading about sisters, though! OH! I don’t read enough brother sister relationships, any recs? I feel like most of the ones I know of are middle grade – a recent read that comes to mind is Spirit Hunters by Ellen Oh, in which the main character’s little brother is possessed by an angry and dangerous ghost. I think the book is scary middle grade at its finest! I just got an ARC of that at work!!! Awesome, I think you might really enjoy it!